Middleton announces redevelopment in former Highway 12 corridor | Vandewalle & Associates, Inc.
WISCONSIN STATE JOURNAL: A rehabilitation of one of Middleton’s prominent streets will begin in about two weeks, following the City Council’s approval this week of a developer agreement. Council members have given the go-ahead for MIG Commercial Real Estate and Food Concepts Real Estate to build Parmenter Center, a 40,000-square-foot office building that will serve as the the first phase of multi-year, $40 million-plus overhaul of the former Highway 12 corridor. 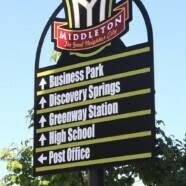 Middleton officials worked with Vandewalle & Associates on the Blight Study, and have eyed redevelopment in the Parmenter Street corridor since the Highway 12 bypass opened in 2006.